Dwayne Johnson’s impossible leap has the internet scratching its heads. We figured it out once and for all. Look, if you thought calculus wasn’t useful for anything outside of your high school AP exams, you clearly haven’t spent 24 hours figuring out whether the Rock falls to his death trying to leap from a mile-high crane into the tallest building in the world. 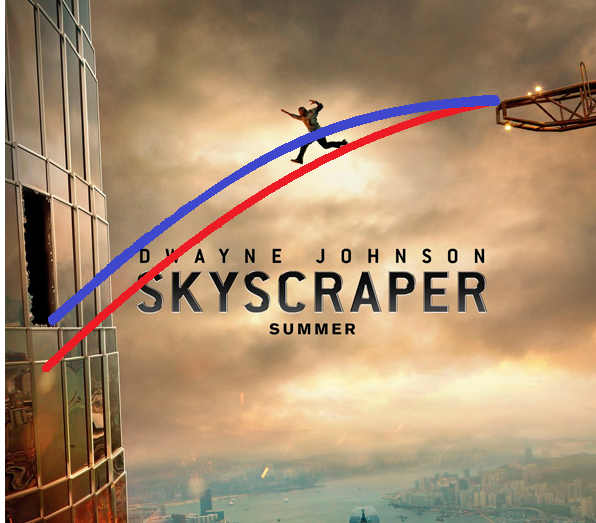 Skyscraper, the new Dwayne Johnson action movie opening July 13, has a plot so amazingly dumb only the Rock could make me type this sentence seriously: A former FBI agent—Johnson, of course, but inexplicably missing a leg—gets framed for a fire in a skyscraper with his family stuck inside. The trailer is chock-full of the standard Rock-brand running and rescuing, but we’re here to talk about the promotional image below, which manages to raise the stakes with a seemingly impossible vault. 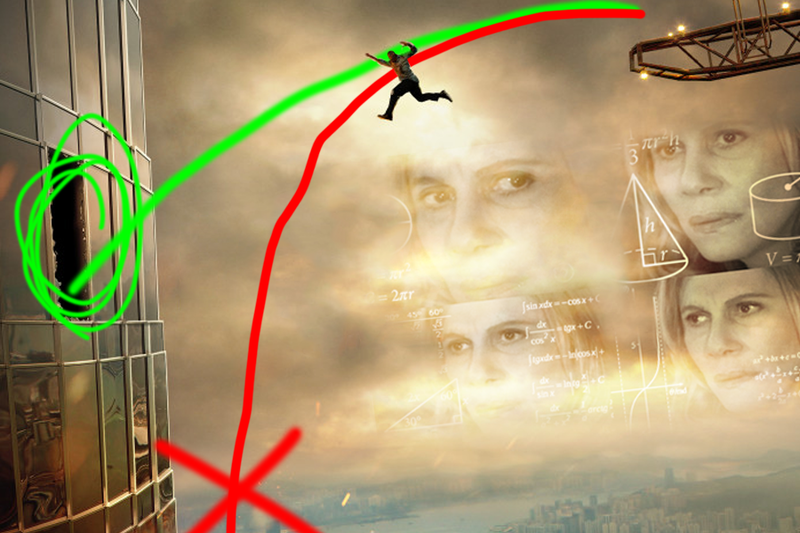 There’s no reason to understand why the Rock is hurling himself off of a giant crane into a smashed-open window somewhere in the stratosphere—only that the internet’s armchair engineers have taken the image and tried to “debunk” it with parabolic diagrams surely sketched with a mouse in MS Paint. The poster went viral and instantly became a meme when it debuted. I mean, it sure looks like the Rock is about to die here. There’s no way he can make that jump. Right? Right? Apologies to the memers and the Twitter smartypants who actually tried to figure it out (spoiler: he’s not quite right), but I had to settle this issue once and for all without actually seeing the movie to find out. I emailed a guy with a PhD: Matthew Zaremsky, an assistant professor of mathematics at the University at Albany, previously Cornell. A day later, he sent back a 650-word analysis, which I will attempt to parse for you here. 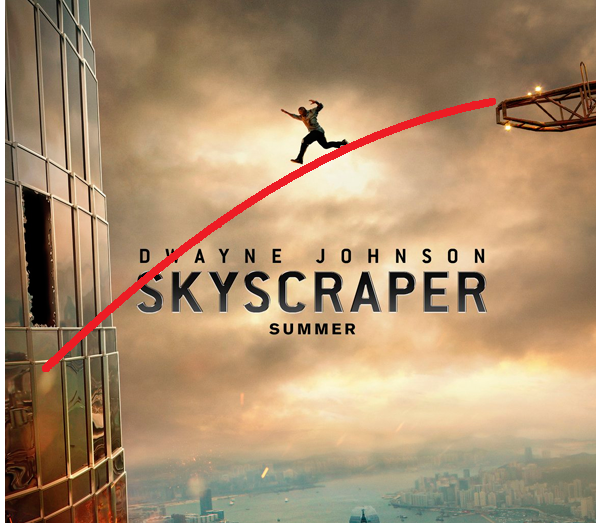 To solve this problem and find the Rock’s trajectory, we need to compute a parabola that connects three coordinates on the Skyscraper poster: Johnson’s destination, his current position and his starting point. First, we need a unit of distance. Johnson is 6-foot-5, so let’s give him a 7-foot span from his feet up to his raised hands. We will call this unit 1 Rock. Next, we need to identify where he’s aiming. He’s clearly not trying to land his feet in the window—that would just be cinematically lazy—so let’s say his destination is 1 Rock below the bottom of the window, so he can just barely grab hold of the edge, shattered glass be damned. Say it is y=ax²+bx+c. Since it contains (0,0), we know c=0, so really the equation is y=ax²+bx. Plugging in the other two points, we get the system of equations 3=9a+3b and 4=25a+5b. The first equation tells us that b=1–3a, and substituting this into the second equation tells us that 4=10a+5, so we have a=–0.1 and b=1.3. This finishes the computation of the parabolic trajectory of the Rock: y=–0.1x²+1.3x. If you made it through that, congrats! We just figured out the Rock’s parabola. The Bigger Question: How Fast Is Johnson Going? The parabola doesn’t solve our problem, though. 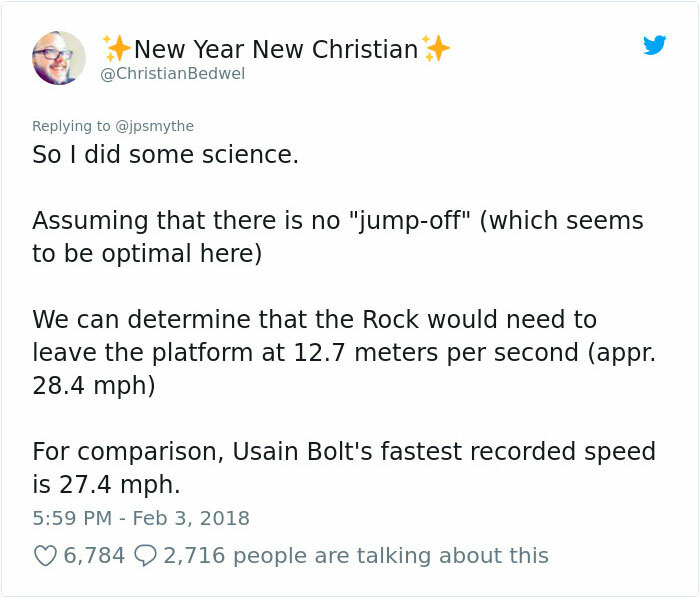 Now we have to deduce the Rock’s necessary initial velocity. In plain English: How fast does he have to be running to make that jump? And is it within the realm of human possibility? His horizontal velocity is constant. Call it h (and note it’s negative because he’s going to the left). Writing t for time (and starting at time t=0), we know that x=ht+5, so t=(x-5)/h. We also know that if v is his initial vertical velocity, then y=–2.3t²+vt+4 (the 2.3 comes from half the gravitational constant “g,” being roughly 2.3 Rocks per second squared). Plugging t=(x-5)/h into this we get y=(–2.3/h²)(x-5)²+(v/h)(x-5)+4. The coefficient on x² is –2.3/h², and we also know it must equal –0.1, so we conclude that the initial horizontal velocity h is roughly –4.8 Rocks per second (remember it’s negative since it’s to the left), so –33.6 feet per second, which is about 23 miles per hour to the left. Next, the coefficient on x is (23/h² + v/h), and we also know it must equal 1.3, so plugging in h=–4.8 we get that the initial vertical velocity is v=–1.44 Rocks per second, or about 6.9 mph downward. OK, Enough Math! Is the Rock Dead or Not? To paraphrase Zaremsky’s work, the Rock needs to run along the crane at 23 mph, then jump slightly downward with a velocity of about 6.9 mph. That will let him grab the bottom of the window in the most dramatic way possible. He could also make it if he jumps upward or directly forward with a slightly slower initial velocity. And yes, that sounds incredibly fast—but it’s entirely possible. The world record for human speed on foot is Usain Bolt’s 27.8 mph.